Stuart (second from left) piping at Ferguson’s shipyard. Stuart was born in Barrow in Furness in 1972 and grew up in Port Glasgow. He graduated in 1997 with an MBA (European) from the University of Abertay, Dundee, and married in 2003. After graduating, Stuart began employment with IBM UK Ltd., then left to work for the SNP group in Westminster before returning to Scotland to be the Office Manager for SNP MSP Bruce McFee. 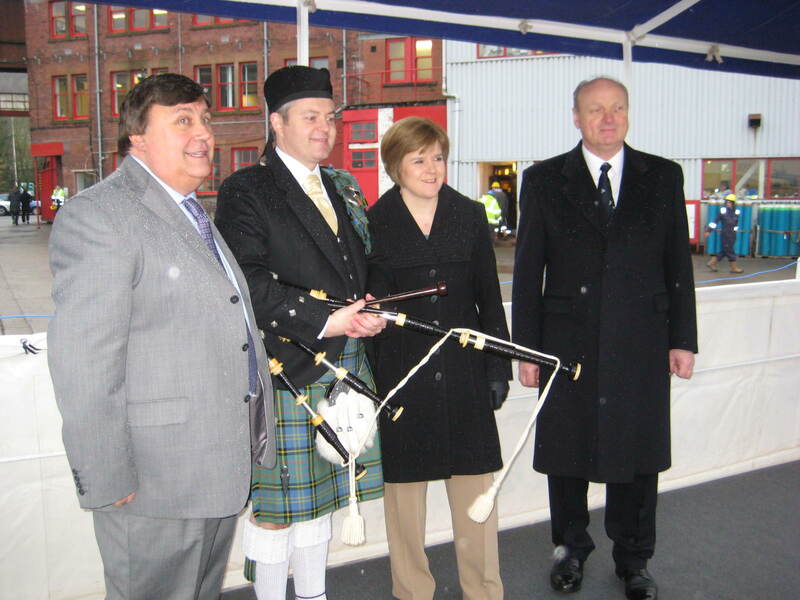 Stuart has served as a Member of the Scottish Parliament (MSP) since his election in 2007. In that time he has led campaigns against the scourge of Fixed Odds Betting Terminals, and was the first MSP to highlight Foodbank awareness in the Scottish Parliament. Stuart has also led on campaigns to help victims of Asbestos issues, and is an honorary member of the Clydeside Action on Asbestos Group. Stuart was also a member of the Ferguson’s Taskforce in 2014 to help save the shipyard. He chaired the Scottish Parliament’s Cross Party Group on Recreational Boating and Marine Tourism until 2016. Stuart was also a member of the Parliament’s Devolution & Delegated Powers Committees. Stuart was elected as the MSP for Greenock & Inverclyde on 5th May 2016, becoming the first SNP member to win this constituency at the Scottish Parliament. Stuart is a keen piper and plays with the London Scottish Pipes and Drums. He likes watching and playing sports and supports Greenock Morton. He currently lives in Inverclyde with his wife and two daughters.